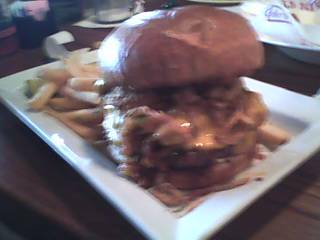 I’ve reviewed Kalamazoo hotspot University Roadhouse once before, when I was disappointed by their Dare Ya Burger. I was told soon after that by two separate people that the real Roadhouse sandwich I should try is the California Reuben. 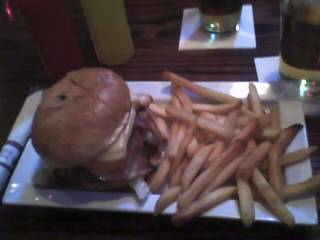 About a week ago, I went out for dinner and decided to give the California Reuben a shot. Before we get started, I should probably explain exactly what makes a California Reuben different from any run of the mill reuben. 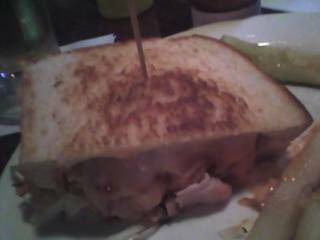 It includes turkey, swiss cheese, coleslaw, and thousand island dressing on sourdough bread. This kind of turkey-coleslaw variant is sometimes known as a “Rachel” in diner lingo, as opposed to a regular Reuben, which has corned beef and sauerkraut. Anywho, it’s great. The taste is different from a reuben, but close enough that fans of the sandwich will probably enjoy it. The coleslaw is an interesting, flavorful alternative to lettuce, and thousand island dressing provides a nice counterpoint to the turkey. All in all, it’s a tasty sandwich that’s both traditional in setup and unique in execution. The California Reuben is available as both an half and full sandwich order, and comes with fries. It runs for arround $5-8, depending on the size. It’s a great sandwich, and if you’re ever in Kalamazoo, I’d highly recommend picking one up.